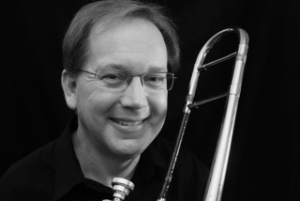 Tim Coffman is one of the most active trombonists and instructors in the Chicago area. A graduate of the prestigious Jazz Studies program at Indiana University, he worked closely with David Baker and Keith Brown. He was awarded the Performer's Certificate after his senior recital. Coffman is in demand for studio and show work and has performed with Frank Sinatra, Frank Sinatra, Jr., Andy Williams, Natalie Cole, Lou Rawls, Louie Bellson, The Woody Herman Orchestra, Frank Wess, Ron Carter, Johnny Griffin, Kurt Elling, Von Freeman, Tito Puente, Tom Harrell, Al Jarreau, Henry Mancini, Stevie Wonder, Diane Schur, Jimmy Heath, Randy Brecker, Benny Golson, Toshiko Akiyoshi, Joe Lovano, Lennie Niehaus, Slide Hampton, Diana Krall, Tony Bennett and Lady Gaga and many others. He performed with the Chicago Symphony playing lead trombone in the Duke Ellington "Nutcracker." He also performed on the recording of "Porgy and Bess," featuring Clark Terry and the Chicago Jazz Orchestra. In 2009, Coffman performed with the WDR Big Band in Cologne, Germany for two weeks, with special guest Arturo Sanduval. He was a regular member of the Rob Parton Big Band and the Chicago Jazz Ensemble formerly led by Jon Faddis and Dana Hall. He is now a member of the New Standard Jazz Orchestra. He debut recording Crossroads is available on the Blujazz label. Coffman is an artist/clinician for XO Brass (Jupiter instruments) and has performed/adjudicated at various high schools, jazz festivals and universities, including Purdue University, Furman University, University of Wisconsin-River Falls, University of New Mexico, DePauw University, University of Wisconsin-Stevens Point, Ball State University; Evanston HS, Rolling Meadows HS, Mundelein HS, Oak Park-River Forest HS, Wheeling HS, and many others. He has been on faculty at the Jamey Aebersold Summer Jazz Workshop at the University of Louisville since 1992.